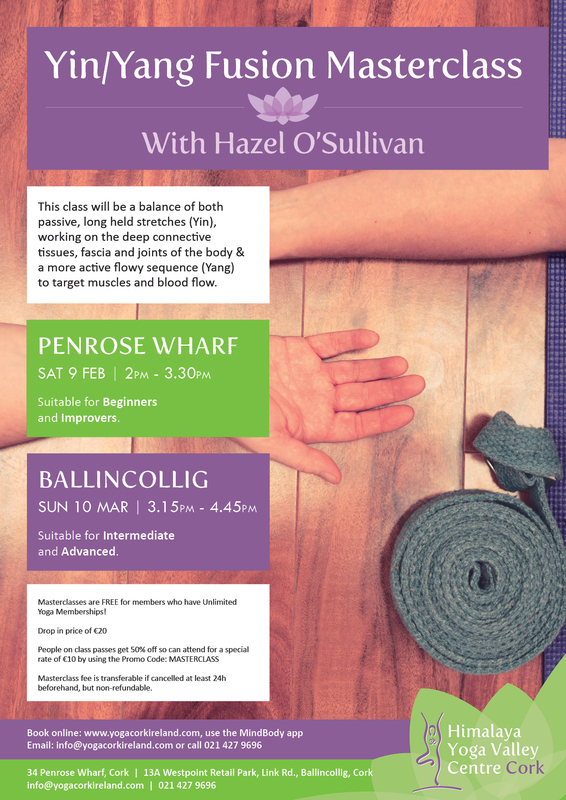 Hazel O’ Sullivan will host two Yin/Yang Fusion Masterclasses, Level 1 (Suitable for Beginners and Improvers) in Penrose Wharf on Saturday 9th of February from 2pm to 3.30pm and Level 2 (Suitable for Intermediate and Advanced) in Ballincollig on Sunday 10th March from 3.15pm to 4.45pm. This class will be a balance of both passive, long held stretches (Yin), working on the deep connective tissues, fascia and joints of the body and a more active flowy sequence (Yang) to target muscles and blood flow and will also include meditation and pranayama. Yin yoga stimulates the parasympathetic nervous system, making us more resilient to stress, it helps to stabilise blood pressure, helps us to sleep better and gives us a better introspective awareness of our body. Yang yoga increases blood flow to the muscles helping to stimulate our circulation and boost our immune function. It helps to strengthen, lengthen and oxygenate our muscles. *Masterclasses are FREE for members who have Unlimited Yoga Memberships! *Masterclass fee is transferable if cancelled at least 24h beforehand, but non-refundable. Book now on the MindBody App or call our team on 021-4279696.